A top-notch world fusion album! A masterfully crafted effort from an unquestionably versatile composer, Origin takes the listener on an unforgettable experience of sacred magic and soulful mystique that seemingly reawakens a long-forgotten era in the distant past. 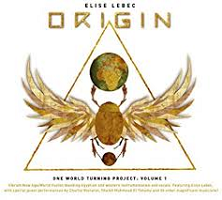 A top-notch world fusion album sure to appeal to many fans of the genre, Origin is also particularly fitting music for modern, fusion and tribal belly dance!